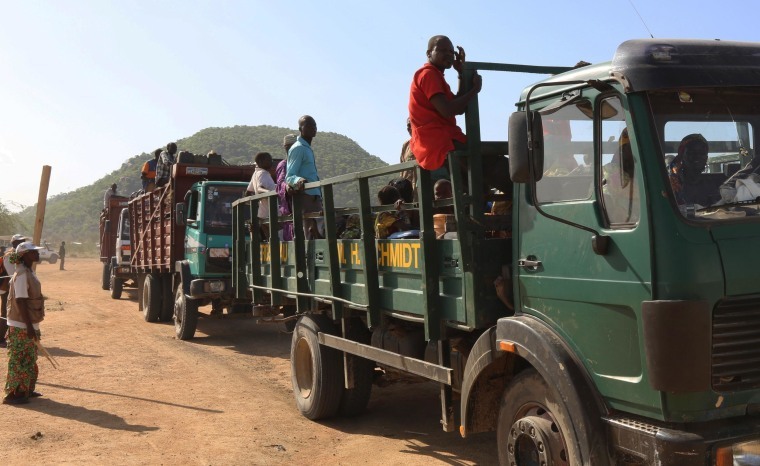 MINAWAO, Cameroon – Tightly packed inside trucks designed to carry cattle and cargo, hundreds of refugees arrived at the UNHCR-run Minawao Refugee Camp in northeastern Cameroon Sunday. Fleeing the terror of the Boko Haram militant Islamic sect, many of the refugees told stories of abandoning their homes in the middle of the night just to get away. Most had traveled for hours in 100-degree heat to reach this safe haven about 55 miles from the Nigeria border. Some children arrived alone after being separated from their parents at border crossings in Nigeria’s northern region. More than 3,000 refugees have fled to this particular refugee camp over the last several months, but Cameroonian officials say as many as 12,000 Nigerians are in the country – many staying in makeshift shelters in the bush. As the security situation has deteriorated, the Cameroon military has expanded its deployment of elite forces, known as the Rapid Intervention Battalion. The terror group has been using the region as a staging ground for attacks across the border in Nigeria. The Cameroonian government says it does not want Cameroon to become Boko Haram’s safe haven and that they have made the fight against the terror group a top priority.